feat. 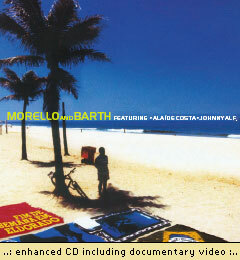 Ala�de Costa & Johnny Alf "Fim De Semana em Eldorado"
Within a few weeks Morello and Barth had gathered enough material to fill an album with excellent, diverse tracks. They invited musicians from the band of Leny Andrade, one of the most multifaceted voices in the triangle of jazz, bossa and samba. These musicians regularly associate with the big names of the m�sica brasileira such as Gilberto Gil, Maria Beth�nia, Djavan or Milton Nascimento. The two drummers Fernando Pereira and Adriano de Oliveira prove that they are equally capable of accompanying Jobim evergreens like "Outra Vez" or romantic guitar themes ("Balada Pra J.") with their sensitive brushing, or they create ingenious rhythmical patterns in "Samba Horizontal". The funky bass of L�cio Nascimento refines the straightforward samba opener. Decent chords and solos from the Fender Rhodes of Jo�o Carlos Coutinho casually fit into the airy melody of "Luciana", concluding with an earthy batucada. Not only bossa nova has made his entry into the range of "Fim De Semana Em Eldorado": Stamping maracat� rhythms from the Brazilian North East teams brilliantly up in a composition of B3 master Kiko Continentino with the flexible passages by Barth and Morello`s uplifting guitar lines. In "Botafogo Bounce" funky, disco-like grooves unite with a samba rhythm filled up by the cavaquinho. Paulo Morello's und Kim Barth's role as "hosts abroad" cannot be overrated. Barth masterfully handles his bebop sax as he does with his fluent Latin flute contributions; dense, always melodious and perfectly phrased lines mark Morello's guitar playing - jazz intensity in its essence, sometimes evoking the laid-back flair of George Benson, but also reminding of some recordings by Cannonball Adderley or Sergio Mendes. Eventually, two vocal legends of bossa nova put the finishing touch to the tropical magic. Ala�de Costa (pronounced "ala'eejee") has already gone down to the annals of her countries' musical history as the Billie Holiday of Brazil. Jo�o Gilberto himself discovered the lady with the smooth alto voice in 1959, and within a short time she reached stardom among the wild youngsters of Copacabana. Her hit of that time, "Chora Tua Tristeza", has been covered by almost all bossa greats and has been re-recorded for "Fim De Semana." as a tribute to this legendary era. Since then, Costa has only released a few records which are all collector's items, and thus her guest appearances on this album are priceless to every bossa aficionado. Her duet partner Johnny Alf is said to be the spiritual father of bossa nova. As early as in the Fifties he paved the way for the new genre with his sensitive treatment of harmonic progression, being influenced by Nat King Cole, Gershwin and Sinatra. His way of playing the piano was admired by the young Jobim and rubbed off on countless Brazilian musicians. Later collaborations stretched from Egberto Gismonti to Gilberto Gil. At the age of seventy Alf recently received the Shell award for his lifetime work. With his charming voice he escorts through the title track, one of his timeless compositions, which truly creates atmosphere of a relaxed week-end between Ipanema and the Sugar Loaf. Besides "Chora Tua Tristeza" Costa and Alf sing a moving duet in Jobims "Outra Vez" as well as in the love hymn "O Que � Amar", another pearl of Alf's making. With "Fim De Semana Em Eldorado" Morello and Barth impressively add a new chapter to one of the most thrilling stories in musical history, that of the encounter between jazz and the rich sounds of Brazil. According to the Latin musicians that were part of the project, these impressions from the Guanabara bay will linger, because they affirmed that these recordings were the most wonderful ones to which they had the chance to contribute since the last ten years.